Successfully Added 4 Channel Video DVR Card (BNC Connection) to your Shopping Cart. 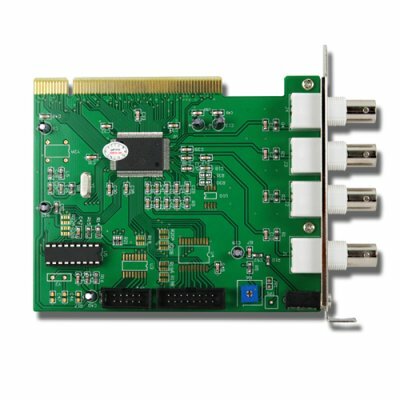 This affordable DVR Card comes with 4 video inputs is a great bargain for anyone who wants to do more with their surveillance system. Simply install this DVR Card into your computer, install the drivers, plug in the security camera BNC connections, and you'll be up and running with the ability to record and monitor amazing realtime surveillance footage from up to 4 security cameras or non-realtime footage from up to 16 cameras. Then for even more exciting options, go through the illustrated user manual to learn how to control every aspect and function of your surveillance video feed with the included software. This DVR card also has the ability to save videos onto your computer and categorize them for future use. Combined with features such as programmable timer recording, alarm triggered recording, motion detection recording and pre-alarm recording, you can be sure that your security system is keeping full alert around your place when you're not present. If that's not enough, a single 3.5mm audio input is available to make sure you have the context to go with the content. This completed system also provides the platform for system integration with other security control systems, such as access control, fire alarm or automation, ID/smart card system, intrusion detection, etc. Along with the camera pan/tilt/zoom functions and an easy to use graphical user interface, you'll have complete and total access straight from your computer. A very low China wholesale price along with Chinavasion's famous 12-month warranty makes this an easy choice for DVR security. Get yours today along with many other amazing electronic gadgets from Chinavasion today! Can I use this with my Windows 7 or Linux computer? The card itself is a PCI card that will work with most computer systems. However, the included software may not be compatible with those operating systems. If you run those operating systems, the you may need to find other monitoring and recording software on the internet that is compatible with the operating system of your choice. Why is this DVR card so cheap? Most of the ones here in Germany cost at least 75 euros! We are giving you a factory-direct OEM card, you are not paying for a middleman or brand mark-up. Does this work with NTSC or PAL cameras? It works with both types of security cameras.